Tags: Black, Chiffon, Churidar Pajama, Evening Dresses, Semi Formal. Top: Black crinkle chiffon frock having amazing embellishments on empire waist. Pretty ornamental motifs are embroidered on bodice. 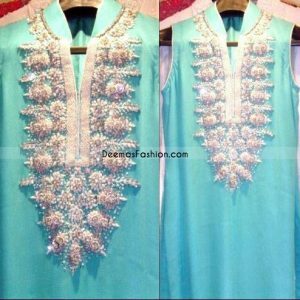 Embellished V neckline Embellishment work includes beads, sequins, dabka, swarovski crystals. 100% handmade embellishments. Fully lined. Sheer sleeves with heavily embellished cuffs and arms. Trousers: Black raw silk plain straight trousers.